To be honest I am completely blown away by this masterpiece. The open minded prog lover and the lovers of the Rock Progressivo Italiano movement will love this. The music could be described like keyboard dominated Symphonic Rock with strong Jazz Fusion, World- & Classical influences. The music is so diverse ... and sometimes breathtaking melodies blissfully are making it's way to your ears. The album has no weak points and is consistent in the quality of the compositions. For me “Odysséas” from the Italian band Syndone is the best progressive rock album of the year 2014. Highly recommended! 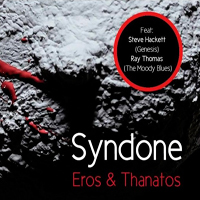 So you can imagine that my expectations were very high when I heard that Syndone made a new album entitled “Eros & Thanatos”. Together with Yugen, Not A Good Sign and La Coscienza Di Zeno I think that these four bands are the most interesting bands on the Fading Records / AltrOck Productions label. I want to thank Nik Comoglio for sending me a signed copy (by all band members!) of their new baby “Eros & Thanatos” and explaining the concept of the album to me. The concept is based on the inspiration that came from reading the bible book “Song of Songs” as interpreted by the poet Guido Ceronetti. The lyrics are based on the concepts of Pure Love, Desire and Death. The words and syntax of the first six tracks echo sacred texts and evoke ancient Syrian wedding rituals. In other tracks the theme of Love is further developed and expanded through references to Syrian poetry by writers like Faraj Bayraqdar and Mahmoud Darwish. Despite those weighty connections the band was inspired to write lyrics of hope and freedom. The album simply celebrate beauty and the power of love without touching on religious or political points of view. But what about the music on this wonderful album. Riccardo Ruggeri opens the album with the short vocoder piece “Frammento” (Fragment). He is the guy who was reading “Song of Songs” and wrote all the lyrics. “Frammento” is an intriguing intro before the band goes full power with “Area 51”, an instrumental and up tempo track that includes great keyboard parts and amazing drumming by Martino Malacrida. At this moment the band will have your full attention. The next piece “Terra Che Brucia” (Burning Land) opens as a beautiful slow ballad with acoustic guitar and delicate keyboard strings. Singer Riccardo Ruggeri shows us that he is one of the best vocalist in the scene. Halfway the track Nik surprises us with full blown keyboards. The pipe organ, keyboards and keyboard orchestrations are great. The next piece “Gli Spiriti Dei Campi” (The Spirits Of The Fields) opens with Riccardo's vocals that are accompanied by a classical piano that is later replaced by The Puntorec String Orchestra. And I just love the use of the vibraphone (played by Marta Caldara) in the music of Syndone. The real String Ochestra and String Quartet are perfectly integrated into the music. This brings the music to a higher quality level. After the classical influences you can hear in the next track “Qinah” more jazz influences. The band is swinging and Nik is going crazy again on his keyboards. After two and a half minutes the band slows down a bit but the overall atmosphere of this piece is progressive jazz fusion with some world music influences. Well this band has an unique style that is so diverse that it is difficult to describe. Just listen to the beautiful vocal parts in the opening of “Duro Come La Morte” (Hard As Death) that are followed by a full band that is burning and rocking. Again I would like to mention the great drumming on this album. And after this the track closes with classical strings and a beautiful melody on the synth. What a great track. “Alla Sinistra Del Mio Petto” (On The Left Side Of My Heart) opens with a beautiful classical piano and bass melody. This short track has beautiful string orchestration and passionate sung vocals. The band is integrating some Arabic influences in the Ruggeri track “Fahra”. Even the lyrics are in Arabic, but all this is done in a delicate and respectful way. “L'urlo Nelle Ossa” (The Scream In The Bones) has a beautiful vocal opening with great melodies and the acoustic guitar is first combined with a delicate string quartet. Later on you hear a the full String Orchestra and all the other instruments. The flute part in this track is played by Moody Blues icon Ray Thomas. The beautiful vocal melodies are often heartbreaking in this amazing track. It is one of the highlights of this amazing album. The contrast is remarkable in “Bambole” (Dolls), that has happy and up tempo refrains. The album closes with “Cielo Di Fuoco” (Under A Sky Of Fire). Again you can enjoy passionate sung vocals. Also the melodies are great. This is the reason that the band who normally don't use electric guitar in their music has asked the master of the melody to play the melodic guitar solo. Yes, I am talking about Steve Hackett. With that beautiful melody, now played on the cello, the album comes to an end. This wonderful album “Eros & Thanatos”, the successor of “Odysseas”, is packed in a beautiful digipak with extended booklet. In that booklet you can find beside the Italian and Arabic lyrics also an English translation. That is just wonderful. I can't emphasize it enough that Italian bands have to sing in their own language to preserve the atmosphere and the passion of their music, well done. The big difference between this album and it's predecessor is that it is not just a project of Nik Comoglio anymore but that the album is made by a real band that also is touring. A bunch of musicians with great musical skills. And as I said before the use of a real String Orchestra is a plus, it is perfectly integrated into the music and it brings the quality level of the music to a next level. The wonderful input of the guests Steve Hackett and Ray Thomas is the cherry on top of the cake. And I just love that pipe organ Nik. You have to listen to “Eros & Thanatos” several times before it reveals its real treasure. It is a gem full of keyboard dominated Symphonic Rock with strong Jazz Fusion, World & Classical influences. Highly recommended by progVisions!